For a moment, it looked like things were going to go horribly wrong. Before a ball was kicked in the 2017/18 Bundesliga, Hamburg were unceremoniously dumped out of the DFB Cup by third-tier Osnabrück, in the first round no less. Hardly an auspicious start for a side who have been flirting with relegation in recent seasons, but the loss was perhaps the spark that lit the blue touch paper ahead of an explosive opening to the league campaign. "Yes, the cup defeat definitely united the team," Hahn explained after last Friday's 3-1 win away at Cologne, which temporarily sent Hamburg top of the Bundesliga for the first time since 2009. "We knew we hadn't played well and we were rightly criticised. We were hard on ourselves and it seems to have paid off. We moved forward together as a team." 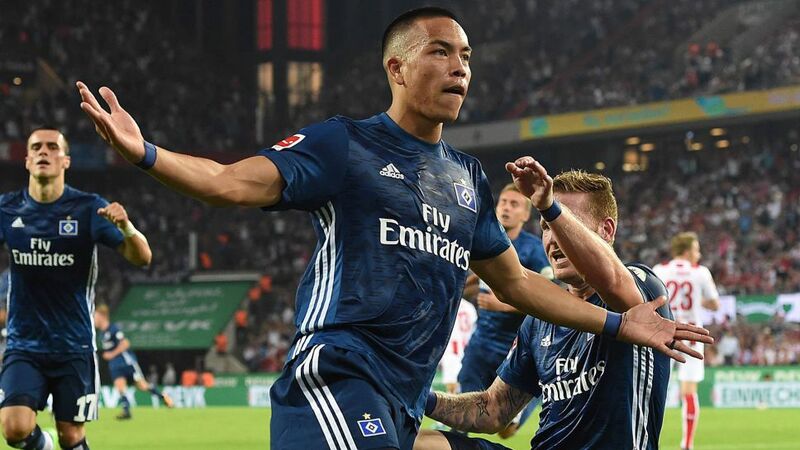 Hahn and Wood both scored within the space of six first-half minutes to put HSV in control of proceedings at the RheinEnergieSTADION, and despite having centre-back Mergim Mavraj sent off on the hour mark, Markus Gisdol's men battled on for a crucial away win. Lewis Holtby even grabbed a late third after Frederik Sörensen had reduced the deficit for the Billy Goats. "It was a hard-fought game," Wood admitted after netting his first Bundesliga goal since March. "It felt like we played 120 minutes today! I'm just happy that we fought as a team, that I got my goal, and that we won. Everything's good." HSV coach Gisdol will be delighted with the burgeoning relationship between Hahn and Wood, especially in the wake of Nicolai Müller's ill-fated goal celebration in the 1-0 win over Augsburg. One ruptured cruciate ligament later and Müller had put himself out of commission for seven months - while fellow winger Aaron Hunt hobbled off after half an hour against Cologne with a hamstring tear, and will also be sidelined for at least three weeks. "The whole squad has to rally round to compensate for the loss of Nicolai," Gisdol stressed. "And that applies in particular to those who haven't played as often as others. Whatever the case, I have confidence in the players at my disposal." USMNT striker Wood will be determined to live up to his considerable potential this term and improve on last season's five-goal haul in the Bundesliga, especially after hitting 17 for second-tier Union Berlin in 2015/16. Hahn, meanwhile, returned from Borussia Mönchengladbach this summer, having played for the Hamburg reserves between 2008 and 2010. Born in nearby Otterndorf, the 27-year-old seems to have had no problems settling back in. "We all know HSV have a lot of potential," Hahn said. "When you get into a good run and you have the fans and the city behind you, it's easier for everyone, and it makes football fun again. Everyone works hard for everyone else, like Bobby Wood, who takes my position when I'm up front. We're approaching our upcoming games with confidence because we know we can win." That kind of positive thinking is crucial for Hamburg - the only side to have played in every single Bundesliga season since 1963 - as they seem to have been struggling under the weight of history in recent seasons. Six-time German league champions (three times in the Bundesliga era), and winners of the 1983 European Cup, HSV have had a number of close shaves with relegation but have always managed, by hook or by crook, to cling on to their place among the elite. After the international break, Hamburg face a serious test when RB Leipzig come to town, but their high-flying start means they should go into the game with greater belief than a year ago, when they slumped to a 4-0 loss at the hands of the Bundesliga newcomers. Besides, they more than got their revenge for that defeat by sweeping to a 3-0 away win in the reverse fixture. Upcoming clashes against Borussia Dortmund and Bayer Leverkusen will give a clearer idea of just what Gisdol's side can achieve this season - but with Hahn and Wood leading the line, don't be surprised to see them reporting back for a record 56th consecutive Bundesliga campaign in August 2018. Quiz: Test your Hamburg knowledge below!